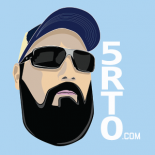 5 Random Thought On (5RTO) was a blog started as an outlet for the random thoughts bouncing around my brain and as a way of getting into the habit of writing on a regular basis. I wrote about my kids, TV shows and how the Skins were crushing my soul. Then I started the Brandcenter and I’ve only posted twice in the past two years.